Spag sanga anyone? 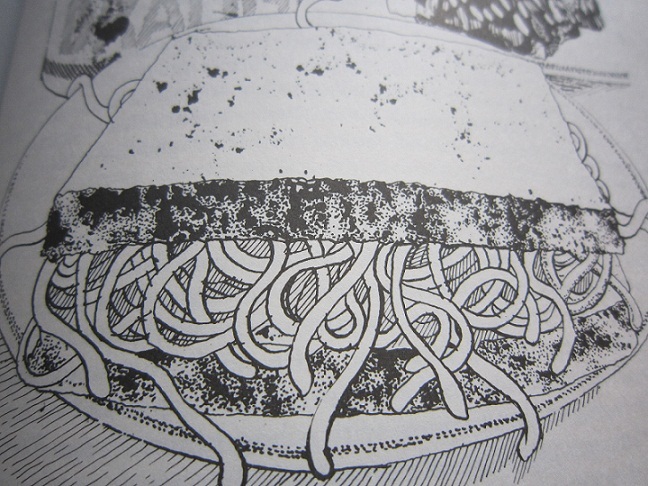 Lorraine Hannay's illustration of a spaghetti sandwich in Richard Beckett's Convicted Tastes. I have a confession to make. I have never eaten a spaghetti sandwich. A tangle of tomato-tinged, soggy and sweet can-confined spaghetti has not ever presented itself to me as a viable sandwich filling. The concept is utterly foreign, which isn’t surprising given I grew up in a household where a can of spaghetti was like bacon to a Jewish Rabbi – not only a banned substance, but one thought of with a fair amount of disgust. Not so for my eighth generation Australian husband who recalls with delight chomping down on buttered white bread crammed with slimy spaghetti. Its construction was quite basic – a spoonful of tinned spaghetti between two pieces of buttered bread. Along with baked beans, it was always an integral part of a plate of mixed sandwiches at city tearooms – now vanished – run by large department stores on their top storeys. When exactly the spaghetti sandwich made its debut is hard to know. What we do know is that to make this historic sandwich you need a can of spaghetti, and that process was kicked off in the late 19th Century by the Franco-American company in the US. By the 1920s it was joined by versions from Heinz and Campbells, amongst others. Heinz, which didn’t start local production till 1934, claims that US miners introduced their canned products to Australia during the gold rush, along with their shovels and picks and dreams of striking it rich too, no doubt. However, by 1917, you didn’t need to know an American miner to get your hands on a can of spaghetti – you would’ve found it along with other imported products like baked beans, cream of tomato soup and “many other desirable lines of distinctive quality” at HG Wilson and Co, “The Family Grocer” on Swanston Street in Melbourne, just opposite St Paul’s Cathedral. 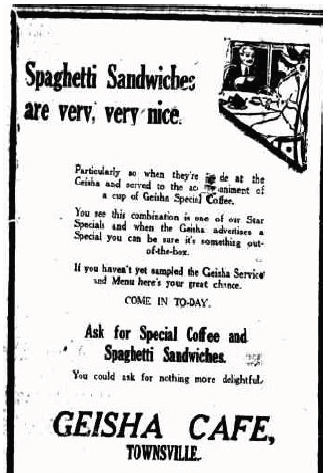 "You could ask for nothing more delightful" than a spaghetti sandwich, according to Cafe Geisha's ad in The Townsville Daily Bulletin,10 September 1924. Reheat the spaghetti thoroughly. Heat the ham in a little milk – either in the oven or over the fire. Place a thick layer of spaghetti on a piece of toast. Cover with another slice on this. Place heated ham and sliced tomato and cover with another slice of buttered- toast. Garnish with a sprig of parsley and sprinkle thickly with grated cheese. Serve very hot. Levenstein, Harvey. “The American response to Italian food, 1880 – 1930” in Food in the USA, ed: Counihan, Carole, M, Routledge, 2002, New York, 78. “Groceries.” The Argus, 23 May 1917, 12. “Spaghetti Sandwiches are Very, Very Nice.” Townsville Daily Bulletin, 10 September 1924, 3.